Arcomage Strategic card game like MTG. Ubisoft popular game. Strategic card game like MTG. Ubisoft popular game. Your skills will be put to the test with Acromage. In this card game, players attempt to build their card tower, acquire resources, or destroy their opponents' tower before their opponent can build their tower or acquire resources. Similar game to Magicthegathering. 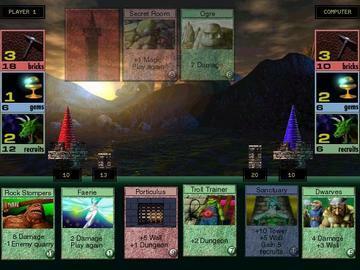 Arcomage can be played by one player versus a computer opponent, two players over a network, or two players via the Internet using TCP/IP connection or the Mplayer service.